Galleria Dante, the largest and most eclectic art gallery in Puerto Vallarta, is located at Basilio Badillo #269. For more information, call (322) 222-2477, or send an email to galleriadante2(at)gmail.com. Puerto Vallarta, Mexico - Exhibitions by Bill Megrail, Tom Dickson and Donna Dickson open at Galleria Dante on Friday, February 23rd, as part of this week's South Side Shuffle. Stop by the largest and most eclectic art gallery in Puerto Vallarta to meet the artists and enjoy complimentary cocktails from 6:00 until 10:00 pm. Bill Megrail is one of the most highly respected local artists. His long career and his talent speak for themselves, and he often exclaims "My life has always been art!" Almost everything Bill does is enthusiastic. A summer school arts program sparked his interest in art, which led to his liberation from a West Virginia coal mining town. "I always supported myself with my talent," Bill explains. After winning a scholarship to the New York School of Contemporary Art at the age of 17, he went on to earn a bachelor's degree in design at San José State University followed by graduate school at San Francisco State University. Although his career has morphed from interior design for commercial retailers to oil painting, remodeling homes and curating a museum, "It's all the same, putting objects in space beautifully... paying attention to color, form, composition," he says. Bill was very successful at commercial interior design for stores like Sak's Fifth Ave and Macy's until age 37. His inspiration is "totally from nature, anything from a home garden to the jungle." For Bill, painting is "meditation in action." It heightens your ability to see. 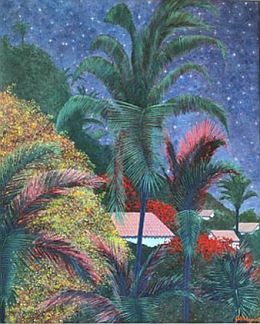 Lush jungle settings with tropical plants, flowers and fruits, country landscapes occasionally dotted with livestock, and a few cityscapes all draw one into the paintings. When Bill was in his 30's he came to Puerto Vallarta from San Francisco for the first time for a two-week vacation and stayed five months, later returning for good. He loved the weather and "in the 70's art was part of the (Vallarta) culture." He divided his time between San Miguel de Allende and Vallarta, later choosing our port city for good. "It was all about the art and its appreciation," he says. Since coming to the Puerto Vallarta area in the 70's he has become a well-known name in the Mexican art community. And he's been supporting community arts programs ever since, like Puerto Vallarta's Cultural Center and the Peter Gray Art Museum, where he was curator for 5 years. Under his direction, the museum facilitated a community activity for local children who were given a tour, introduced to various forms of art through demonstrations, and then produced a painting of their own. During his illustrious 30-plus year artistic career in Mexico, he has had showings at many galleries nationally, in the United States and London. His paintings have been printed in such publications as Mexicana Airline's In-Flight Magazine (2 covers) and the Insider Guide to Mexico. In the 90's he was invited to Southeast Asia on an art buying trip as an advisor. In 2004, the town of Domburg, Holland invited Bill to participate in the International Painters' Week. He was also published in the Architectural Digest December 2008 Exclusive Issue: Inside Private Homes. The client not only purchased many of Bill's paintings, they also commissioned him to do a large painting for a focal point in their villa. To Bill there was never any other kind of life. "If you're an artist, what else can you do? There's no choice. Anything else makes me absolutely insane. I can't go to business meetings. If nobody ever bought another painting, I'd still paint." Tom Dickson was born in Hamilton, Ontario in 1947. He began painting in oils at the age of 10 with his father, and from that point onward art became a focus in his life. After studying at Toronto's Ontario College of Art in the mid '60's, he began to paint the countryside and wilds of northern Ontario. It was there in Tobermory that he met his future wife Donna and together they went on to share their life with their mutual love of art. Tom is a Signature member of International Plein Air Painters. His art first became critically recognized during the 1980's while exhibiting in major galleries in the Halifax area of Nova Scotia, Zwickers and the Hollis Street Gallery being the most notable. He enjoyed great success as a painter of marine and city scenes, attracting a growing number of collectors. Beginning in the 1990's he also began showing on the west coast and not too long after moved to Hornby Island, British Columbia, where, a few years later he and Donna opened a very popular summer gallery of their own. He continued through the '90's to call B.C. home, enjoying the distinctive west coast environment in summer and spending the winter months in sunny Mexico, where it's possible to paint outdoors in any season; something Tom and Donna very much like to do. Tom had first come to Mexico in 1967 and been absolutely enchanted with the scenery, the people, the culture and history. In 1970 he returned again with Donna and since that time Mexico has been included as a major part of their life experience. They now live and paint in Mexico full time. After having been based in the historic colonial era town of San Miguel de Allende for 10 years, they now paint from their studios on the west coast, just north of Puerto Vallarta, at the beach town of Rincón de Guayabitos. 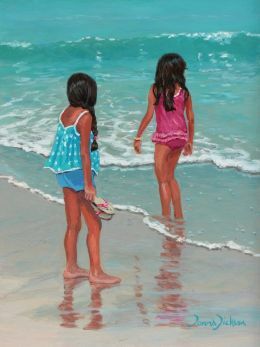 Most of the show will be wonderful paintings of the beaches north of Vallarta: San Pancho, Sayulita, Chacala, Ayala, Guayabitos, La Penita and San Blas, to name a few. Tom is quickly becoming one of the top sellers at Galleria Dante in Puerto Vallarta. Donna Lee Dickson was born in Vancouver, British Columbia. She showed an early interest in art and began to paint seriously on a trip to Greece in 1973. At this point her work was showing great promise and by the early 80's her Maritime themes were very popular - selling briskly around the Halifax area of Nova Scotia, where she was living during this period. She also showed an aptitude for teaching painting technique and students began asking that she give regular classes. In the fall of 1990 she decided to return to the west, re-discovering her roots and finding new challenges in the mountainous landscape of British Columbia. As well as exhibiting in many regional venues, she also opened a gallery of her own on Hornby Island, British Columbia, which over the years became a favorite destination of many an avid west coast art collector. Her art classes became increasingly popular and in the 1990's she began teaching in Mexico, a country with which she was becoming increasingly familiar, having first visited the charming, colonial era town of San Miguel de Allende in 1970. In 2005 she decided to make Mexico her permanent home and now resides full time, dividing her time between San Miguel in summer, and the Pacific coast, north of Puerto Vallarta, in winter. 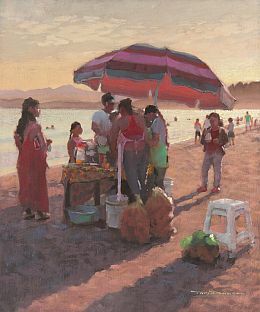 She finds the climate to be perfect for a plein air painter like herself and the light, people and color of Mexico provide endless inspiration. Two years ago, Vallarta became their permanent home, with short trips to San Miguel to teach. Donna has studied with some very accomplished professionals over the years, the most notable among them, Alvaro Castagnet of watercolor fame and the well-known modern masters of oil and plein air, Carol Marine and Kevin Macpherson. Her work can be found in literally hundreds of collections worldwide. She loves to teach art, but is also passionate about people, nutrition, bird watching and nature hikes. You will see many of your favorite Vallarta spots captured in her paintings. Donna's paintings in Puerto Vallarta are sold through Galleria Dante, in Old Town. Come meet these 3 wonderful artists for cocktails from 6:00 to 10:00 pm on Friday, February 23, at Galleria Dante. While you are there, be sure to check out Di Vino Dante, a chic wine and tapas bar overlooking the gallery's sculpture garden. In late June, Di Vino Dante opened a small dining area on the ground floor in a corner of Galleria Dante, for those who like to people watch. Be sure to ask about their new three-course dinner menu. Open Mon-Fri from 10 am-5 pm, Galleria Dante is located at Basilio Badillo #269 in Puerto Vallarta's Romantic Zone. For more information, click HERE, call (322) 222-2477, or email galleriadante2(at)gmail.com. To see some of the art work on display at the gallery, visit GalleriaDante.com.